Last year I collected hundreds of cherry pits from my June and July farmer’s market cherries with the aim of making cherry pit ice cream. This pastry chef waxes poetic (and X-rated) about the alluring, phenomenal flavor of the kernel inside cherry pits, taking the sexual metaphor regarding the reward for the effort put into extracting the kernel to its fullest. After I smashed several dozen of them, however, I immediately hucked the whole heap into our compost bin. If you have several hours to kill, go ahead and try making the cherry pit ice cream and let me know how it turned out. Fortunately or unfortunately, I am never faced with several hours to kill so I probably will not be making that one very soon. Apricot pit or apricot kernel ice cream, on the other hand, seemed much more realistic. Since I also buy several flats of apricots each year, usually Blenheim, I am happily familiar with the heady smell of the apricot kernel. This is my fourth year making apricot jam and one trick I always have for making it is crushing the apricot pits, extracting some of the kernels, which are doppelgängers for almonds in both sight and smell, and cooking them in a little cheesecloth in the jam. I remove them at the end and proceed with canning the jam. 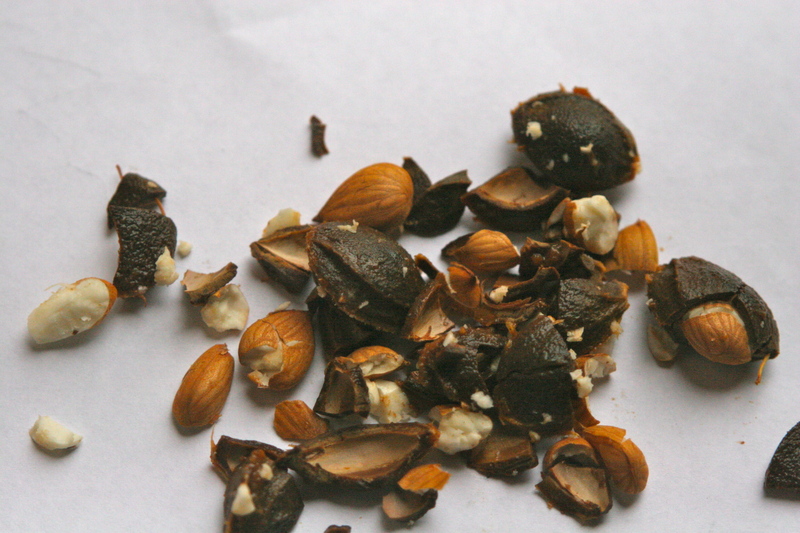 The flavor the kernels impart to the jam is similar to that of almonds or almond extract, but not quite. It is mysterious. Beautiful. And….dangerous. Actually, in large quantities, there is a toxic chemical called prussic acid, a.k.a. cyanide. Apparently you can toast them at 350F for about ten minutes to remove the chemical, but you need to have such large doses to cause harm that I have never bothered. Since the only things I have ever used the kernels before have been my jam recipes, my revelation that I could make apricot kernel gelato induced an new obsession. 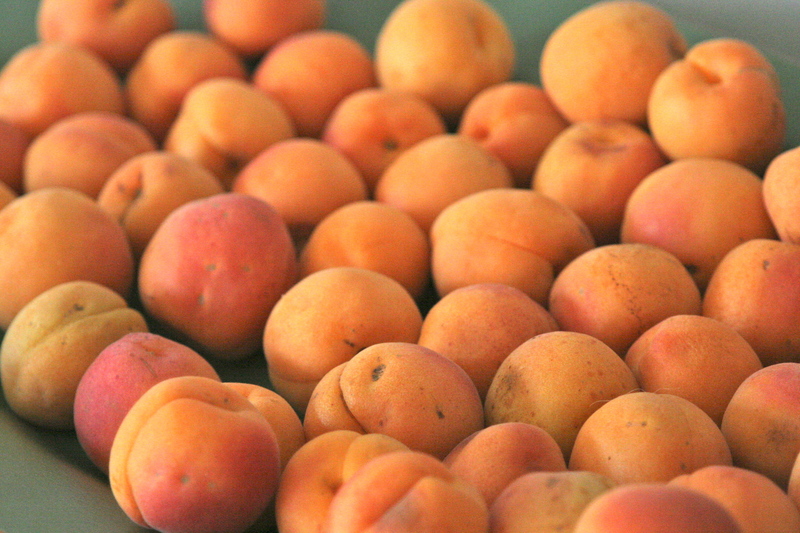 I cannot stop imagining the fabulous recipes where I could swap in a couple of apricot (or other stonefruit) kernels where almonds are called for….or not called for, just for fun. Frangipane, amaretti, meringues, panna cotta, cantucci, pancakes even! That being said, I have known about a traditional Piemontese roasted peach dessert (“Pesche alla piemontese”) with amaretti that calls for the kernel for a long time, but never thought of making it myself. Here are a few pointers if you feel like experimenting. For maximum flavor with minimum stonefruit pits, you need to extract the flavor slowly. Typically this involves bringing whatever liquid you have to a boil (jam, cream, milk, simple syrup) with the smashed kernels in it and then taking it off heat to sit for several hours (or minimally 30 minutes if you are making jam). If you are making cookies, I recommend using a mortar and pestle with a tablespoon or so of boiling water, much like one would do when preparing saffron threads for a Persian rice dish. As for my ice cream, I prefer Italian style gelato over American ice cream. Gelato is much lower in fat from the use of a higher percentage of milk than cream, uses whole eggs over mere egg yolks, and is slower churned, which results in less air being incorporated into the ice cream itself. American ice creams tend to be richer and airier. Incidentally, my favorite vanilla ice cream recipe from my grandfather happens to be just like an Italian custard cream gelato (as opposed to a fruit sorbetto or fior di latte, which typically has no eggs). The only rate limiting step (literally) when making this gelato/ice cream is your ice cream maker. The more modern makers have speed options, in which case choose the slowest possible setting. If you cannot choose, do not fret since the ingredients are the most important part of my recipe. Finally, this ice cream elevates any warm stonefruit dessert from pies, cobblers, crisps, tarts, and upside down cakes to another level. It reincorporates the noyaux flavor from the pit back into your dish and tastes heavenly. 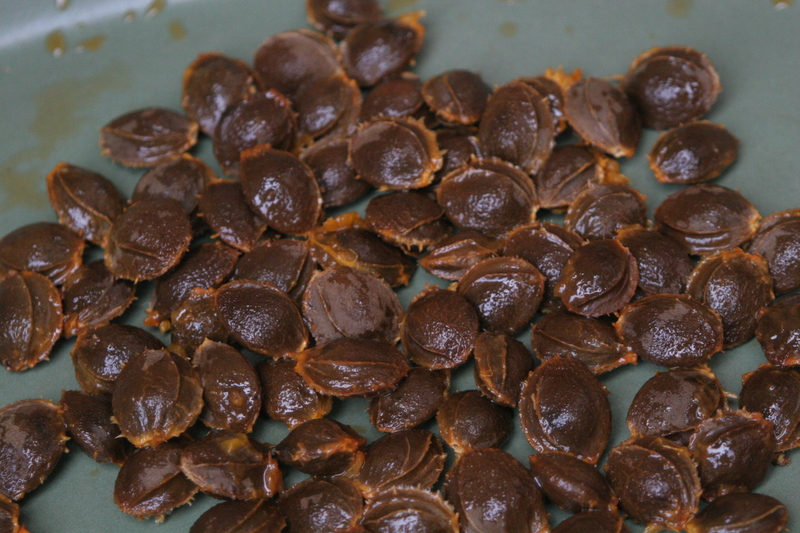 I will be posting just such a dessert soon, but until then save a couple of apricots (not yet pitted or they will brown) to roast with honey and eat them with your ice cream. It may be my favorite dessert of the summer (thus far anyways). Notes: I encourage organic milk and half and half simply because in a dessert where the dairy flavor is showcased, you want the very best tasting stuff. Also, try to make the ice cream at least an hour before serving just to harden it up a bit before. Feel free to substitute other stonefruit pits or mix them up if you do not have enough of one or another. The day before you want to make the ice cream (or at least the morning of), put all your pits into double sealed plastic bags, take a hammer and crack each pit once to remove the kernels. Place the crushed kernels into a pot with the milk and half and half. Bring the milk almost to a boil and then take off of the heat to sit for a couple of hours or overnight. AFter it has steeped for several hours, use a mesh sieve to remove the apricot pit by pouring the liquid through it and into another pan. Bring the infused dairy mixture back to almost a boil. Meanwhile, whisk together the sugar, eggs, and salt and then slowly whisk in the flour until you have a very smooth mixture. Take half a ladle of the hot milk mixture and quickly whisk it into the egg-sugar-flour mixture, slowly add the rest of the dairy, constantly whisking and then pour all of it back into your stove pan and cook on medium for about 6 or 7 minutes until the liquid thickens up like a light custard. Remove from heat, strain the liquid once more through a fine mesh sieve and then refrigerate the ice cream base until cool and ready to make your ice cream. 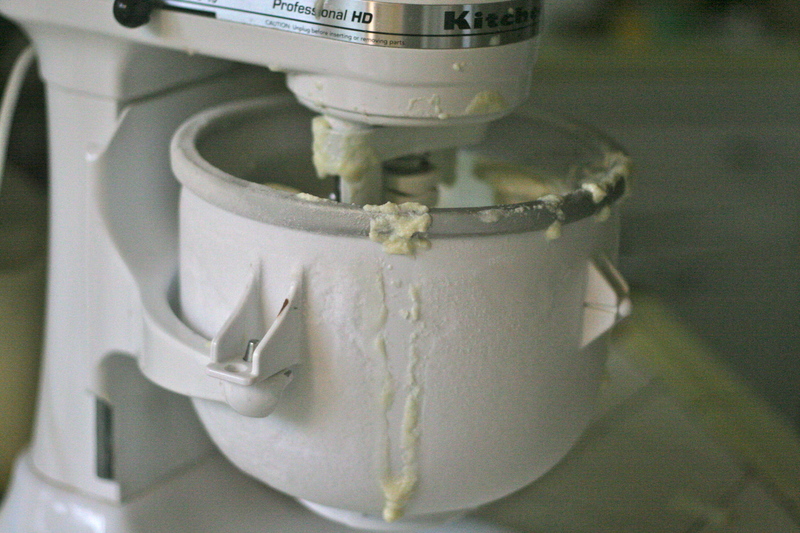 Process the ice cream base according to your ice cream maker’s directions and then place in a container in the freezer for at least an hour before serving. Cut each apricot in half. Place cut side up on a roasting pan and put half a teaspoon of honey in each whole. Cook on high in your toaster oven or preheat your oven to 400 F degrees and roast for about 6-7 minutes. 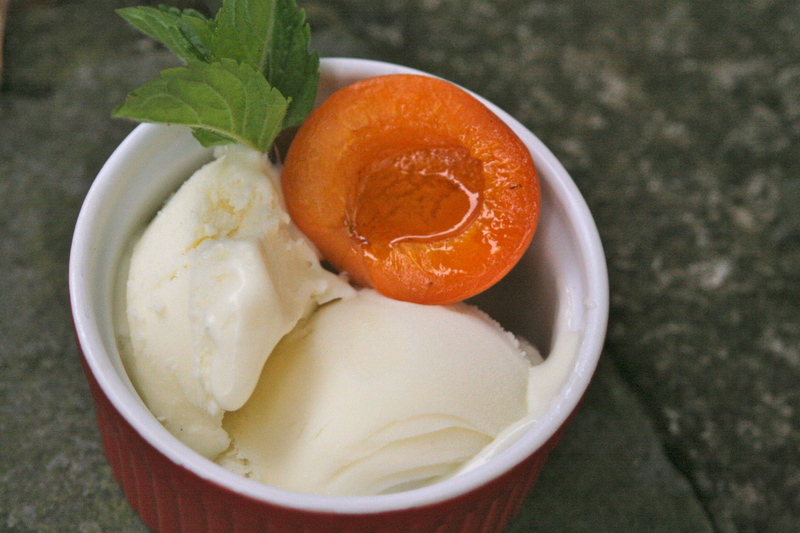 Serve with a scoop of apricot kernel gelato. This entry was posted in Dessert, Icy things, Recipes for Egg Whites and tagged apricot kernel ice cream, honey roasted apricots, recipes for apricot pits, stonefruit pit ice cream recipe, what to do with cherry apricot pits, what to do with stonefruit pits noyaux. Bookmark the permalink. Your recipes (and your pictures) inspire me! !